Potatoes and chopped dill are such a common side dish in Romania, that I've never thought of posting this recipe by itself. But after having been singled-out as the best recipe at several dinners with friends, I thought it deserves its own spot. Here, the basic dish is further complemented with green garlic and bacon pieces, for a result that boasts both great taste and enhanced colorful presentation. - First, use a pan to fry the bacon strips (no oil is needed, just heat up the pan and cook the bacon on both sides until they turn a nice red color). When ready, remove from the pan, and tear the strips into smaller bite-size pieces. - Wash and peal the potatoes, then cut them in cubes. We'll first boil them to get them soft on the inside, then broil them at high heat to add a nice crust all around. - Bring water to a boil. Add the potato cubes, and keep boiling for about 15-20 minutes. The potatoes are done when a toothpick easily goes through them, but they are not yet mushy (if you boil them for too long, they'll start falling apart). Use a colander to discard the water. - Heat the oven to 500F. Take a baking pan, and lightly coat it with oil (to prevent the potatoes from sticking to the bottom). Add the potatoes, and place the pan in the oven for about 15-20 minutes (or until you see the potatoes starting to take a nice caramel color). Use a spatula to turn the potatoes, and sprinkle the spices (salt, pepper, and chili pepper) all over. Place back in the oven for another 10-15 minutes. - While the potatoes are cooking, chop about a cup of fresh dill, and 1-2 green garlic plants. 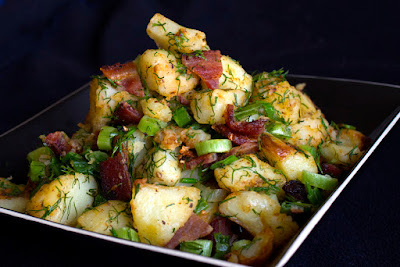 - In the end, mix together the potatoes, bacon, dill, and garlic.